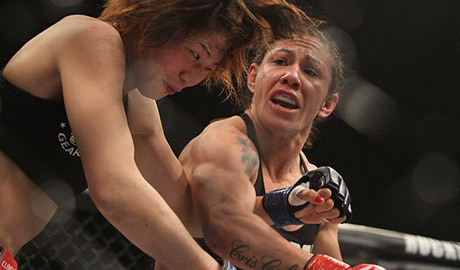 As the UFC and Cristiane “Cyborg” Justino’s camp continue discussions of a potential “mega fight” between Justino and Ronda Rousey, Justino will look to win her 13th consecutive fight in a featherweight title defense against Charmaine Tweet at Invicta FC 11. Justino (12-1) and Tweet (6-4) will headline the Invicta 11 card at the Shrine Auditorium in Los Angeles, California on February 27, the same weekend that UFC bantamweight champion Ronda Rousey sets to defend her belt against Cat Zingano. The UFC has been working to put together a contract which would allow Justino to continue to fight at Invicta as the featherweight champion, yet come to the UFC for a match against Rousey in the bantamweight division. Charmaine Tweet has won her last two fights, with her last fight a TKO victory over Veronica Rothenhausler at Invicta FC 8. Justino has not competed in mma since July 2013, when she defeated Marloes Coenen at Invicta FC 6 by way of TKO. Justino did compete in a kickboxing match at Lions Fight 14 back in March 2014, she lost to Jorina Bears. Since her kickboxing fight, Justino has been recovering from a nagging ankle injury which is being reported as fully healed.